If you want to implement a complete framework and do it right from the beginning, the most important activities in a Benefits management strategy could be as the image to the right, the Benefits Management Circle. Benefits Management, as described in books and papers, contains more activities than this. You might miss some about stakeholder engagement, or to creating a benefits register. But all such activities can be part of the benefits realisation plan and the following benefits realisation project. It could also, on a larger scale, be activities within a business change program. In this website, I now choose not to describe each activity in detail, but in the coming Reliable Business Case Handbook, I describe more about this framework. 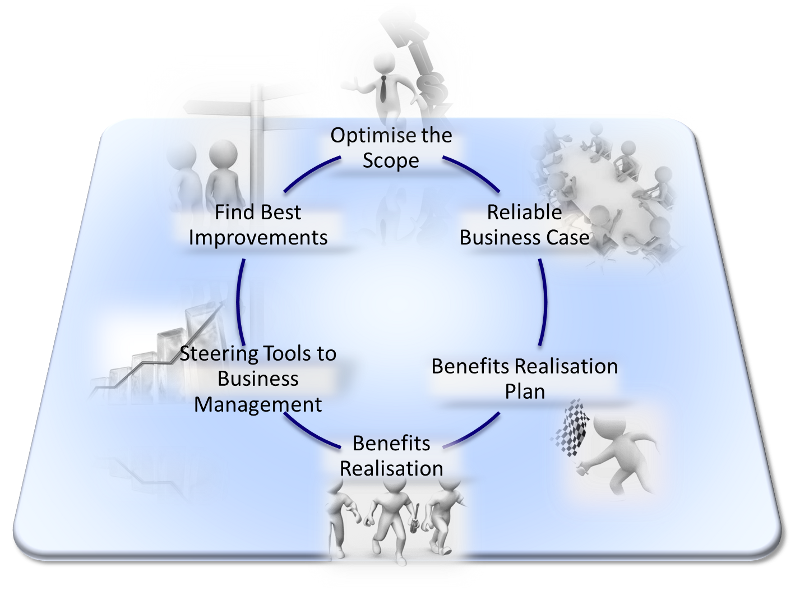 This Benefits Management Circle is the context the Reliable Business Case method and RBC Excel Tool operate within. Implementing a Benefits Management framework is a response to following a vicious circle. Often, you lack data about the business you run. Both the management who make decisions based on gut feeling, and the investment/project owner, who need a business case with decent reliability. The IT investment is usually driven by the need for more-or-less intangible business benefits, justified with any tangible benefit you can find – or ‘invent’. The scope is often too narrow, too technical, to carry a profit. The business case is built by people with too much technical focus, and the organisation lack policies on how to calculate, estimate and translate benefits into money. The calculation time span uses to be too short, excludes important future operational cost, and omits internal cost and efforts needed to produce the IT-solution and to make the future business change. The case can show whatever you want, or what chance gives you. And you pick and select what you can find and what you think the decision makers accept. The investment decision is purely technical, with no plan on how to ensure the benefits and result comes true, and no benefits realisation manager is there to ensure the execution of needed process- and organisational change. Sometimes measurement and follow-ups are carried out, but they are too late - they just damage control. Or just concern implementation of the IT-system. You cannot follow KPIs during the benefits realisation, because you did not include them in the business case, and not in the IT system's requirement. You cannot see or communicate the progress, you have no one who supports management, and you never escalate benefit-risk to the steering group. It is just ROI by Chance, remember? Without new KPIs to measure the investment's profitability and a result, you still lack useful data when it is time for your next generation of IT investment. Your business case is built on poor data, and your history of poor abilities to forecast results sustains. The vicious circle is established. Maybe worse, your ability to measure the performance of your organisation and processes also remain poor, and the organisation's management act by 'gut feeling'. Your entire business might be run by chance and gut feeling.